is a 5 Star Hotel with Half Board and All Inclusive service. The Hotel has an own private beach and build over a 16.424 m2 area and has 174 rooms. In Sueno Golf Hotels Belek, even the rooms that we define as standard offer 5 star comfort. Single, double or family… Everyone lives this comfort and unique luxury.What are the things that make a room comfortable? Bathroom with a bathtub, central air conditioner, direct phone line, blow dryer, satellite broadcasting plasma TV, info and music channels, internet access, minibar, safe and balcony… And it is in the ideal size for families… After all of these opportunities, the only thing you have to do is to enjoy your perfect room and holiday. Do you want to taste the quality feeling that golf leaves in your soul? In Sueno, we call this a flavor classic. • In our Chef’s A’la Carte restaurant, you can taste the specialties of Italian, French, Thai, Mexican, Turkish cuisines and seafood. In all of these spaces, the special flavors offered by award-winning chefs are to add flavor to your joy of life. Greens Bar, Birdie Bar (Snack Bar), Beach Bar, Vitamin & Pool Bar, Bunker Bar, Amphi Bar, Pier Bar, Buggy Bar… In Sueno, we want you to experience the joy of golf and holiday everywhere at every moment. 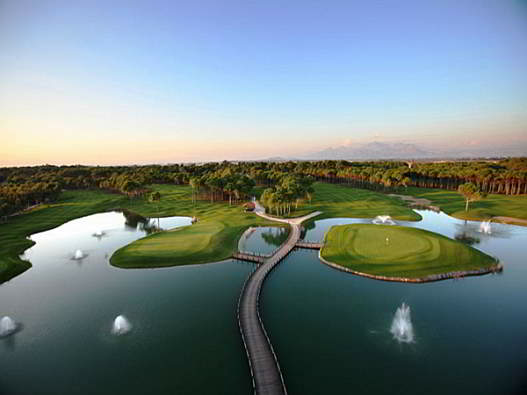 Where is Sueno Hotels Golf Belek ? The Hotel is centrally positioned and has its own 2 X 18 hole golf courses Pines and Dunes. Also the Carya Golf course is very close to Sueno. The other golf courses are between 5 km (3 miles) to 10 km (6miles) distanced to your golfing holiday hotel. How do I get to Sueno Hotels Golf Belek ? The Sueno Hotels Belek, golf courses Pines and Dunes are directly accesible from the Lobby. There is no need for shuttle. 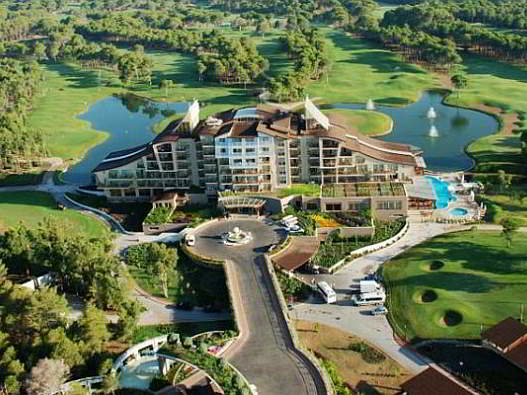 Sueno Hotels Golf Belek is not offering free shuttle service to any golf courses. For the evening there are three a la carte restaurants which you can book at the guest relation service one day in advance with charge. All the hotels in Belek area offer evening entertainment with the animation teams in the hotel. Usually in the summer season (April to October) the evening shows are in the amphitheaters or beaches. There is also live music (vocal or instrumental) in different areas of the hotel. The Hotel discotheque opens from around 22:00 to 03:00 . Unfortunately the Belek area does not offer as much in the way of nightlife as it does for golf . There are a few local restaurants and bars in the town , but the city of Antalya is much better . Antalya offers very good restaurants , bars and night clubs , especially in the centrally located harbour . We recommend you to ask advice from your Golfdelights Guide.